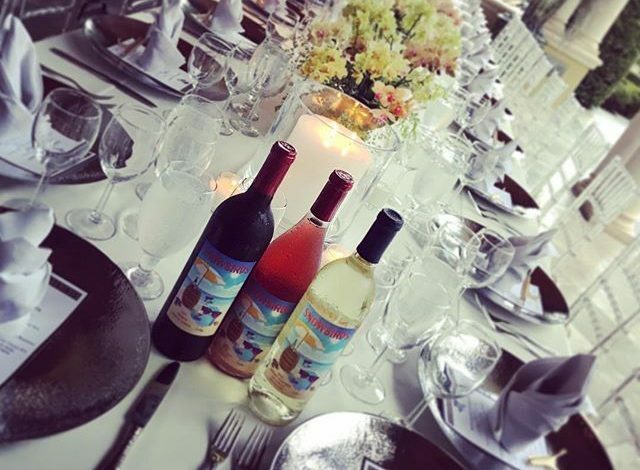 Snowbirds Vintners 2016 Rosé Wine Kicks Off With Summer Cocktails! Summer is here, and that means barbecue, fun, and friends. Celebrate the warm weather with a bottle of Snowbirds Vintners newest release, a 2016 all American Rosé, created for easy food and wine pairing. Produced by award-winning Orlando Chef Jamie McFadden and winemaker Norm Saley, Snowbirds Vintners 2016 Rosé, a Washington grown wine, is a refreshingly bright, fruit forward blend produced from three Rhône style grape varietals in the Columbia Valley AVA – Syrah, Mourvèdre, and Grenache. Together, they create an all American wine with high quality, flavors, and structured minerality – the perfect companion for any occasion. A portion of proceeds from the sale of every bottle go to The PEAS Foundation, a charitable organization, founded to help bring fresh fruits and vegetables to local homeless shelters, soup kitchens, and other non-profits in Central Florida. Below are two cocktails for summer sipping, as well as Snowbirds Rosé official tasting notes. This twist on an adult granita will cool you off in a big way, no swimming pool required. Add the cooled simple syrup, citrus juices, and liqueur to a bowl. Stir in Snowbirds Vintners Rosé, then pour into a freezer-safe, non-metallic tray. Freeze until a thick layer of crystals have formed (2 hrs), and scrape the bottom and sides of the pan with a fork to break up the ice crystals. Continue to freeze for 8 to 10 hours, until the consistency is firm. Scrape again, and scoop into small glasses. Garnish and serve immediately. Serves 5. A riff on the traditional Hemingway-style daiquiri, this classic cocktail gets a modern take with the addition of bright, cheery rosé. Shake the rum, lime juice, and simple with ice, strain into chilled coupe glass. Top with Snowbirds Rosé, stir once. Garnish with a lime wheel. Shimmering salmon in color, with hints of lavender on the rim, bright aromas of wild strawberries and rose petal are present on the nose, as well as hints of white pepper and summer stone fruits. With five months in stainless steel to age, Snowbirds 2016 Rosé Columbia Valley AVA wine is crisp and juicy on the palate, with a medium body, and balanced acidity. In late 2016, award winning Chef Jamie McFadden (Winter Park, Florida) dived into the wonderful world of wine to create Snowbirds Vintners, a portfolio of small lot, hand crafted wine varietals. From an early age, Jamie grew up helping his father make wine, and his mother was always in the kitchen whipping up something new, with a Julia Child cookbook ever at the ready. At an early age, Jamie knew he was destined to become a chef, but winemaking continued to beckon. It’s serious wine, in a not so serious bottle! With sales kicking off in the southeast, Snowbirds Vintners has chosen to bottle locally, cutting down costs to transport heavy glass (which saves on energy emissions), and also to create a wine on tap program, creating zero waste for restaurant partners. Snowbirds Vintners wines are always sustainably sourced and produced, using 100% vegan and gluten free production and storage methods. The winery incorporates rainwater recycling and organic pest control practices, as well as natural fertilizer from vine trimmings and plant materials, to help nurture the soil and land. Giving back is also part of Snowbirds culture. A portion of proceeds from every bottle goes to The PEAS Foundation, a charitable organization, founded to help bring fresh fruits and vegetables to local homeless shelters, soup kitchens, and other non-profits. Find Snowbirds on the shelf at Whole Foods and a growing list of Florida retailers, on their Facebook page, and for purchase online nationwide at Quantum Leap Winery.